In the login window click the ‘Settings’ button to enter the database management wizard. In the Database Settings window, click the ‘Create’ button to open the New Database Server window. In the New Database Server window enter a name (used in RM Studio) for the database under the Required Information. 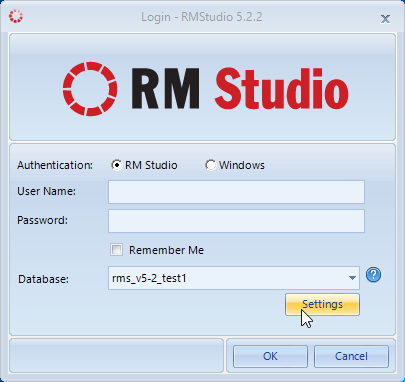 *Remember that the database names, usernames, and passwords are case sensitive in RM Studio. Enter the name for the database on your server. It is not required to have the same name for the database, because the Database Name is for your reference on your servers only. Choose where the database is stored, locally on the PC you are using, or on the designated server. If you intend to share the database with other users, you must select a server that each user has access to. 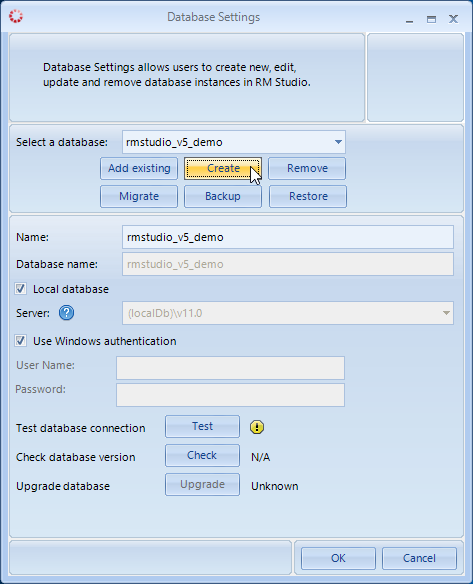 Check with the appropriate IT personnel to adjust the server permissions for each RM Studio user to a DB_Owner. Choose to use the Windows Authentication for the login (recommended for higher security) or choose to create RM Studio user logins in the Common > Contacts of the main program and assign specific roles, such as, Admin, Super User, etc. (more info under Contacts section). 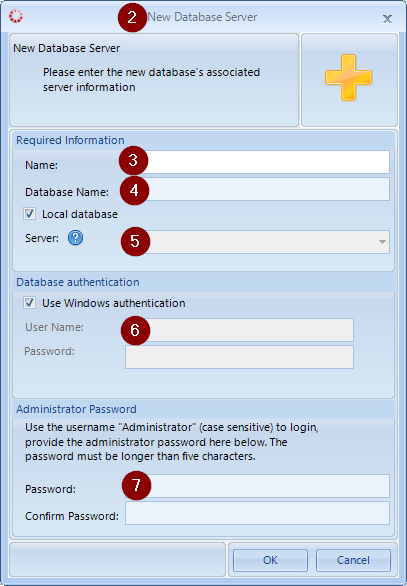 The new database automatically creates an Administrator login that you need to assign a password to. The Administrator is also created as a default Contact in the main program for you, but you can assign other RM Studio Users/Contacts the Admin role. The Administrator account is vital for the administration of the database. 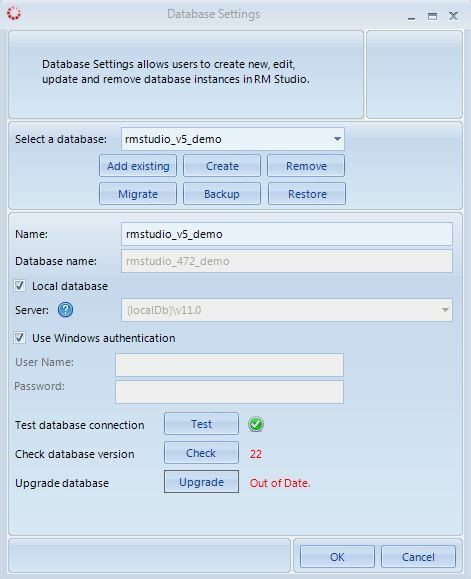 Exception – upgrading from a previous version of RM Studio and connecting the database to the new version. Because the Administrator account is tied to the database when created, the Administrator password should have been changed when the previous RM Studio installation was used to create the database. 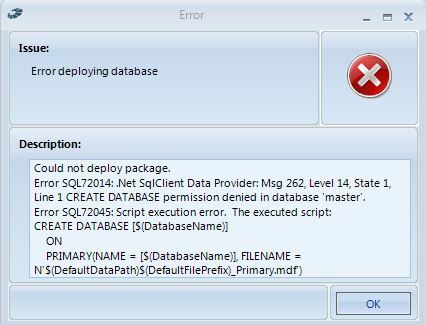 If you receive the error below, then you are not authorized to create the database on the server you selected. Please contact the appropriate person responsible for the server administration in your organization. Once your database is created a green ’check mark’ icon appears next to the ‘Test’ button. Click the ‘Check’ button and allow a a few seconds to check the database connection. Once the action is complete you will see a green number to the right of the button and the word ‘Upgraded’ in green. Click ‘OK’ to complete the database setup.